During a sixty-eight year career, conductor Arturo Toscanini (1867-1957) was famed for his fierce dedication, photographic memory, explosive temper, and impassioned performances. At various times he dominated La Scala, the Metropolitan Opera, the New York Philharmonic, the NBC Symphony, and the Bayreuth, Salzburg, and Lucerne festivals. His reforms influenced generations of musicians, and his opposition to Nazism and Fascism made him a model for artists of conscience. 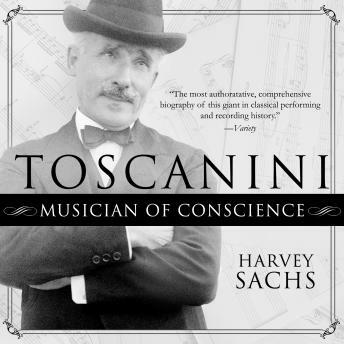 Thanks to unprecedented access to the conductor's archives, Harvey Sachs has written a completely new biography that positions Toscanini's epic musical career and sometimes scandalous life against the roiling currents of history. Set in his native Italy, across Europe and the Americas, and in 1930s Palestine, Toscanini soars in its exploration of genius, music, and moral courage, taking its place among the greatest music biographies of our time.